Jonathan Beck worked to improve vehicle paint shop efficiency at GM. The Global Facilities division enlisted Jonathan Beck to recommend energy reduction projects at vehicle assembly plant paint shops for General Motors. Beck joined Karl Nagengast and Tiffany Ho of the University of Michigan’s Tauber Institute for Global Operations, to work with paint engineers to perform pre-engineering studies of equipment and operational changes at five US vehicle assembly plants. Beck recommended installation of Variable Frequency Drives on process pumps, equipment operating pattern optimization and ventilation improvements. These proposals will enable GM to reduce energy consumption while maintaining unit production rates. His team also produced an internal paint shop energy benchmark to assist in identifying future areas for energy reduction at GM. The paint shop energy projects have the potential to save approximately $2 million in annual operating costs via reducing annual electricity and natural gas usage by 15 million kilowatt hours and 80,000 MMBtu, respectively. By implementing these projects, GM could reduce annual greenhouse gas emissions by 16,000 metric tons of carbon equivalent. 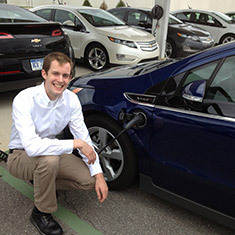 Jonathan Beck, a student at Columbia University, was hired as the 2013 EDF Climate Corps fellow at General Motors.